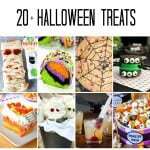 Fun and easy Halloween cupcake decorations the kids will love! Devil's food cupcakes decorated to look like a bubbling cauldron. Bringing back this contributor post from a few years ago because it’s too cute not to share again. Originally posted on Oct 8, 2015. 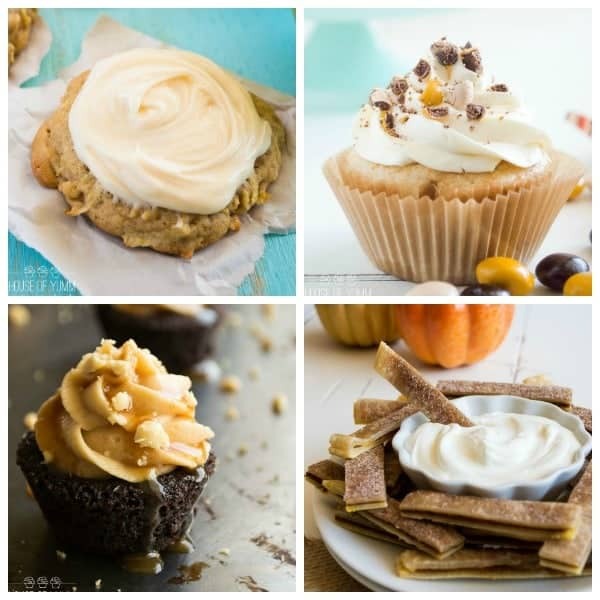 Hello Cupcakes & Kale Chips Readers! Serene from House of Yumm back with you for another cupcake! I figured a Halloween cupcake was definitely called for today. Which led to these Witches’ Brew Cupcakes! 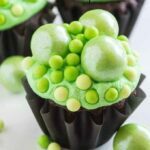 Devil’s Food Chocolate topped with fluffy green frosting and tons of sprinkle ‘bubbles’ to create a bubbly cauldron that any witch (or child, or adult!) would be happy to devour! Bake your favorite chocolate cupcakes or use a box mix. 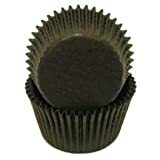 Be sure to use black cupcake liners so that they really look like a black cauldron. Make the super light and airy Cloud Frosting recipe. It’s made with cold cream cheese and heavy whipping cream. The end result is so fluffy and soft it’s slightly unbelievable. 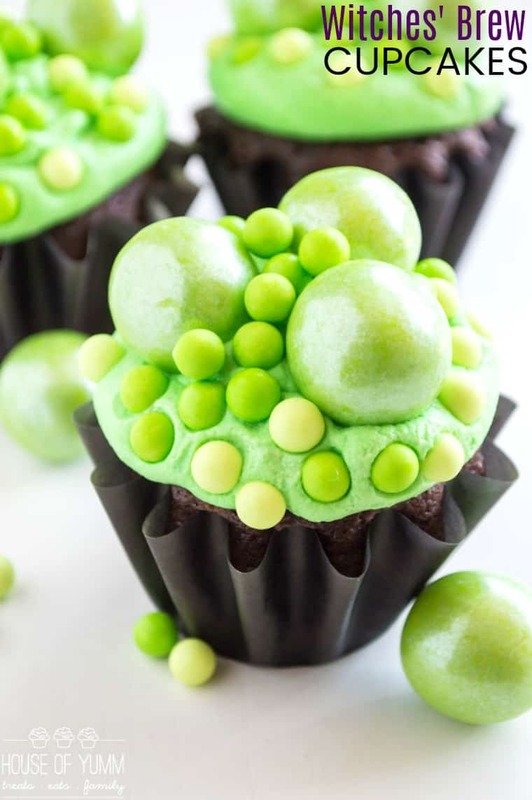 Tint the frosting green using Wilton Leaf Green Food Gel to achieve the perfect witches’ brew slimy green color. A piping bag with a Wilton 2A decorating tip perfect to pile the frosting high on the cupcakes and make it look like a potion is bubbling over. 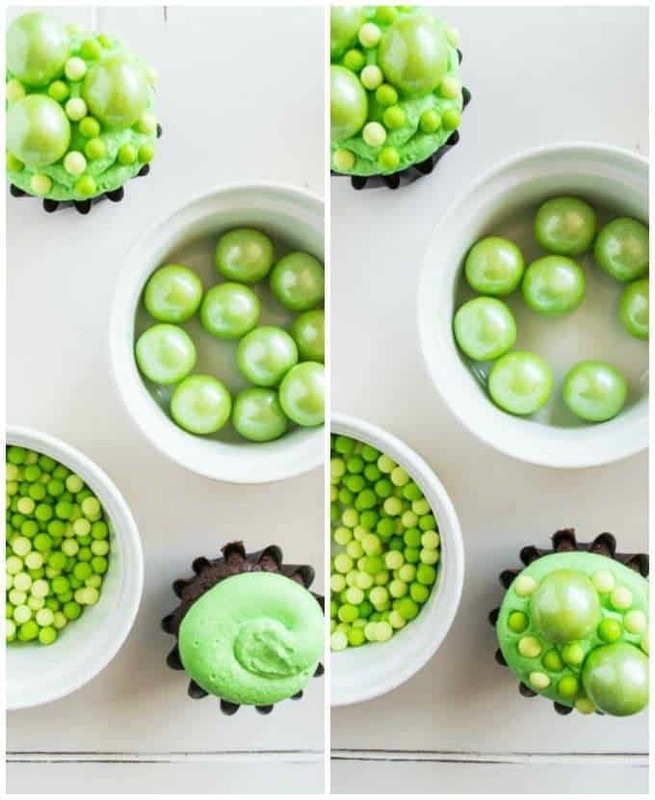 To create the bubbles, use a variety of sizes of sprinkles. These cupcakes used gumballs and large candy sprinkles from Wilton. You could create the same effect with any of the round ball type sprinkles that are available in most markets though. 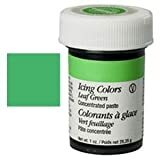 The fun of these is you can really add as much or as few ‘bubbles’ as you want! You can also pile on the frosting to make it even MORE bubbly! Hmm..more frosting?? Ok! 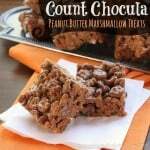 These would definitely be a fin treat after you’ve had some Jack O’Lantern Shepherd’s Pie Stuffed Peppers or Bloody Maria Steak Bites for dinner! 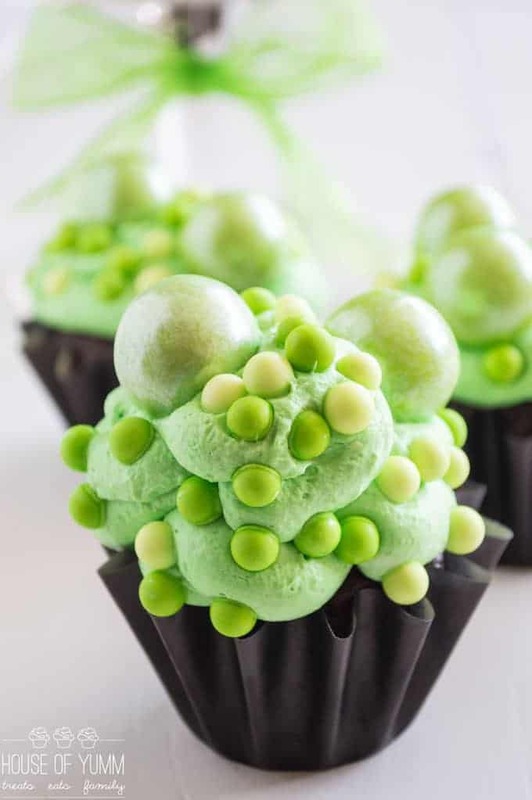 Making your favorite chocolate cupcakes look like it’s boiling over with a fizzy green potion from a black cauldron is super simple. Just bake them in a black cupcake liner, pile them high with fluffy frosting, and then have fun with sprinkles and candies of all sizes. That’s a magical concoction every kid will love to sink their teeth into. Prepare the cupcakes as according to the cake mix directions. In large mixing bowl cream together the cold cream cheese and powdered sugar. Add in the vanilla extract and heavy cream. Add to piping bag with Wilton 2A piping tip. Or use a large plastic bag with the tip cut off. Pipe frosting onto cupcakes into either a swirl or pile the frosting up to create more 'bubbles'. 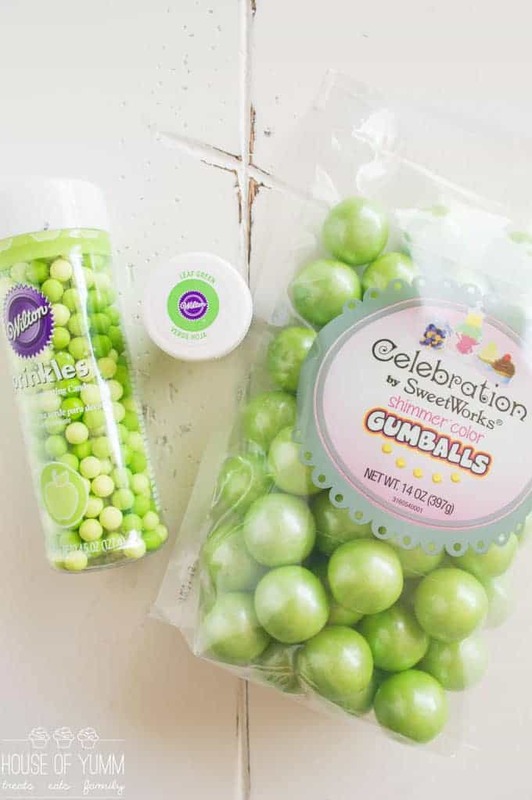 Add the gumballs, or large sprinkles, then the smaller sprinkles to create a 'bubbly' appearance. 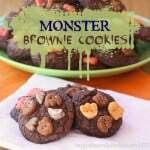 More Recipes from House of Yumm you may enjoy! What a great idea. These are so festive! The pilled on “bubbles” is a great touch!